This Excel spreadsheet helps you calculate erosional velocity in Excel. The offshore oil industry often requires the transport of liquid, gas and solids in long distance pipelines. This causes the pipe surface to erode, with the rate of erosion increasing with the flow velocity. The American Petroleum Institute have guidelines (see API RP14E) for the flow velocity below which erosion damage is minimized. This maximum flow velocity is a function of velocity and density, and given by this equation. If ρ is in lb ft−3 and V is in ft s−1, then C has units of lb0.5 ft−0.5 s−1. API RP14E recommends that C=100 lb0.5 ft−0.5 s−1 for continuous service of liquid with solids, or C=125 lb0.5 ft−0.5 s−1 for intermittent service (or values of up to 200 lb0.5 ft−0.5 s−1 if the pipelines are corrosion resistant). However, recent studies have recommended that higher C values are used, with values of 887 for 13Cr piping for "clean gas service" (see the paper "Improved Procedures for Estimating the Erosional Rates in High Offtake Gas Wells: Applications of University of Tulsa Flow Loop Derived Correlation" for more detail). This Excel spreadsheet implements the API RP14E equation to calculate erosional velocity. 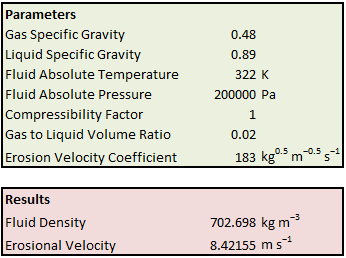 If you enter the specific gravity of the liquid and gas components, the gas/liquid volume ratio, the the absolute temperates and pressures, and the compressibility factor, the Excel spreadsheet will calculate the mixture density for you. Note that the spreadsheet expects all values to be in SI units, including the erosional velocity coefficient C (a conversion factor is supplied in the spreadsheet). Dear Shamir before anything I want to thank you and to congratulate you for your site which is helping a lot in my job. I used the ErosionalVelocity.xlsx spreadsheet and I think that the "fluid density" calculation formula must be "=(0,1204594*sl*P*(1-gor)+0,003484922*gor*sg*P)/(1,204151*0,0001*P*(1-gor)+gor*T*Z) " instead "=(0,1204594*sl*P+0,003484922*gor*sg*P)/(1,204151*0,0001*P+gor*T*Z)"
Hi Jorge. I believe you are wrong. If I use your formula and increase the gas to liquid volume ratio to a large number (lets say 1E10, meaning there's only gas inside the pipeline), I get negative densities.